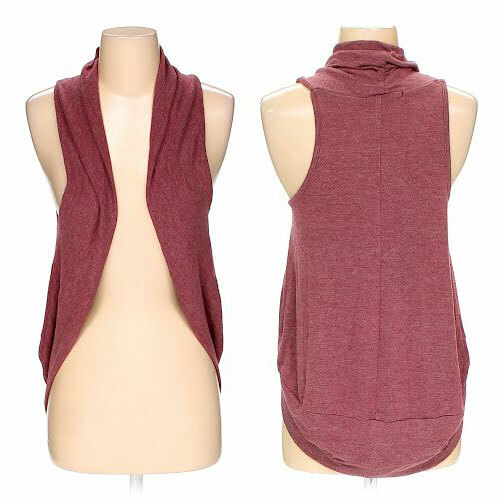 I'm in love with open-front vests! They can add a splash of color to any outfit, and they're useful for covering up spaghetti straps and other skimpy tops when you want to stay cool but don't want to show a lot of shoulder. This particular vest just wasn't doing it for me. I didn't like the way the front panels curved and connected in the back. I think a straight-up-and-down front opening is more flattering. I detached the front panels almost the entire length, and then reattached them so they hung straight down! ...Or I can knot the panels in the front for a twisted look! I never had a knotted vest before, but I think I could get into it! I have one more photo of the reassembly process on my original blog post, but you've basically seen it all! Thanks for reading! This looks like an odd garment before and after, until you tie the knot when it all comes together, you've worked some imaginative magic here. It looks great, I like it knotted in the front too. It looks very modern and cool.